This breed is one great watchdog that the entire family can enjoy. 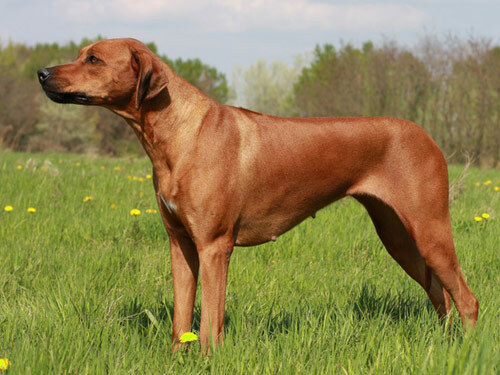 The Rhodesian Ridgeback is a scent hound that is an exceptional hunter. They can easily become excited when they play with little ones, making training as a pup a mandatory element to a safe environment for the kids to engage with the hound for years to come. They are terrific at gaining power over another dog and when they engage with strangers to protect their families. They can reside with a cat with no issues, and they also are built for performance and can handle just about any physical activity. Until you have properly trained your Rhodesian Ridgeback hound, be sure to leash him always as once they take off you will have a difficult time trying to catch them as they are extremely fast runners. This hound is good at living in any temperature or climate be that one that is cold or warm and their short fur coats make it a cinch to care for them in hot conditions. The Rhodesian Ridgeback is a natural born athlete and will need stimulation each day to keep them happy. This may come in the form of a quick jog or run, and it can also come in the form of simple pet toys left for the canine to entertain themselves with all day long. While they can adapt to any climate, they do desire to spend their time resting inside versus outdoors. They are a long and strong breed, making them not very suitable to reside in a space such as a quaint apartment that does not bode enough room for them to play and move around freely inside. One nice thing about owning a Rhodesian Ridgeback dog is that they have very limited health concerns as they age. CHD and having an overactive thyroid can be an issue, but that is normal for any dog. Their build allows them to trap and hold their game while hunting which also onsets some hip conditions as they age if they were used as hunting dogs at one time. They can also become subjected to hearing loss, sinus complications and common canine thyroid issues as well. Average lifespan for a Rhodesian Ridgeback is anywhere from ten to twelve years long. These dogs can reach an average weight of seventy to eighty five pounds once fully grown. When the settlers were seeking a dog that was able to withstand frigid temperatures, they overlooked the other hounds such as the Great Dane and the Pointer and found great their favorite in the Rhodesian Ridgeback breed. They had just enough athletic ability and strength to hunt and a could adjust to cold temperatures when needed. Excellent at being both a sight hound and a scent one, they were utilized many years ago to trap lions until their owners came for them. These canines were given the nickname of "lion dogs" and became very popular in their native South Africa. Once they were bred in the United States, they were bred as great family pets as well as guard dogs in the 1900's.